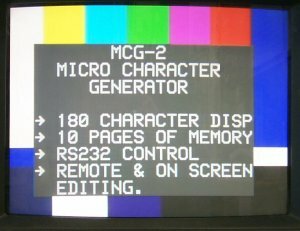 The Burst Electronics MCG-2 Micro Character Generator is a genlockable unit that accepts a standard NTSC (or PAL) video signal and overlays basic black and white characters with a selectable black and white background. Character and background intensity are independently adjustable from white through black. A video input is required for operation. Maximum number of characters displayable at one time is 180 (20 characters by 9 lines). There are 16 character sizes (4 character heights and 4 character widths) allowing page by page text emphasis control. Display pages can be highlighted by the use of an adjustable background, and individual characters may also be set to blink for an additional effect. Built-in Menus, Help Screens and Self-test all add to ease of use. Text input is performed with front panel push buttons in a "letter up/letter down" and "cursor left/cursor right" fashion. Up to 10 pages of text can be stored and recalled from battery backed memory. 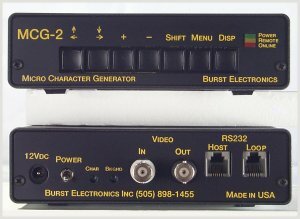 An RS232 interface for connection to a PC is standard. Text can be downloaded from a PC. A Real Time Clock Option is available that allows Time of Day and Date information to be overlayed on video. The RTC is battery backed. The RTC can be programmed by the front panel or via the RS232 link for additional flexibility. Applications include Source ID, Bulletin Board Displays, Subtitling, Message Screens, Time Keeping and Clock Display Applications. Options: Real Time Clock (RTC), Y/C, Rack mount. RTC option for MCG-2. Allows date and time to be displayed.